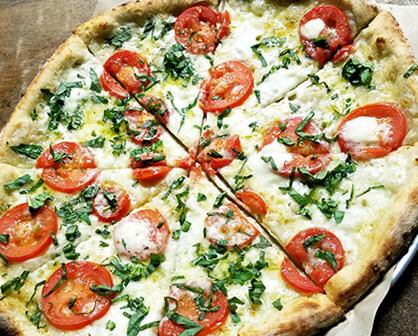 A classic 12″ pie with an EVOO base, fresh basil, fresh tomatoes, fresh mozzarella, herbed parmesan and a drizzle of extra virgin olive oil to top it off! This is a fresh and delicious pizza that’s good for the body and great for the soul! Pair it with a crisp ale (perhaps one of our signature brews) for a great summer treat.